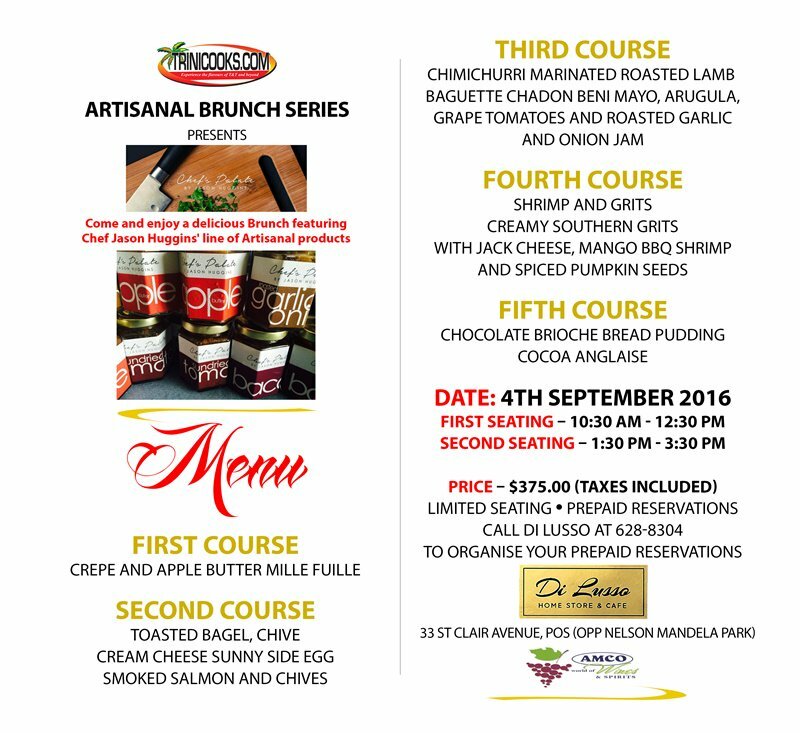 2016 TRINIDAD RESTAURANT WEEK! 16th – 25th SEPTEMBER participating restaurants and menus are here (link). 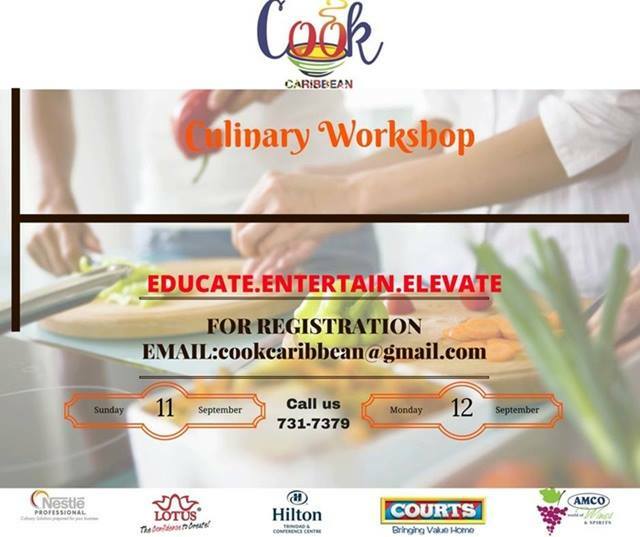 SATURDAYS, September 3rd through October 8th, 9am-3pm, COOKING WITH CONFIDENCE 2 (short course) at Chaguaramas Campus of TTHTI (Trinidad & Tobago Hospitality and Tourism Institute). Cost is $1,850. Email info@tthti.edu.tt or call (868) 634-4250 for more information. Link to flyer. SATURDAYS, September 3rd through October 8th, 9am-3pm, COOKING WITH CONFIDENCE 2 (short course) at San Fernando Campus of TTHTI (Trinidad & Tobago Hospitality and Tourism Institute). Cost is $1,850. Email info@tthti.edu.tt or call (868) 634-4250 for more information. Link to flyer. SATURDAYS, September 3rd through October 29th, 9am-4pm, PROFESSIONAL BARTENDING (short courses) at San Fernando and East Trinidad Campuses of TTHTI (Trinidad & Tobago Hospitality and Tourism Institute). Cost is $1,850. Email info@tthti.edu.tt or call (868) 634-4250 for more information. Link to flyer. 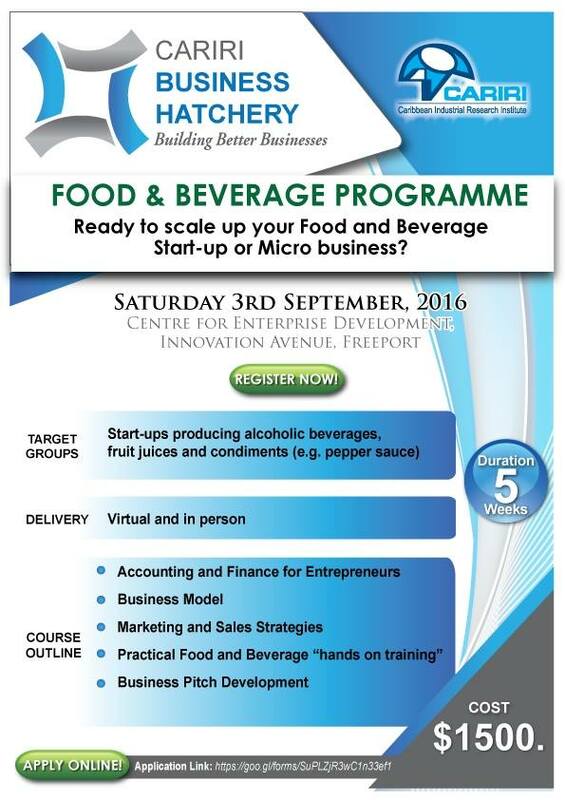 Saturday, September 3rd, UPMARKET at Woodbrook Youth Facility (Woodbrook, Trinidad). FREE ENTRY! 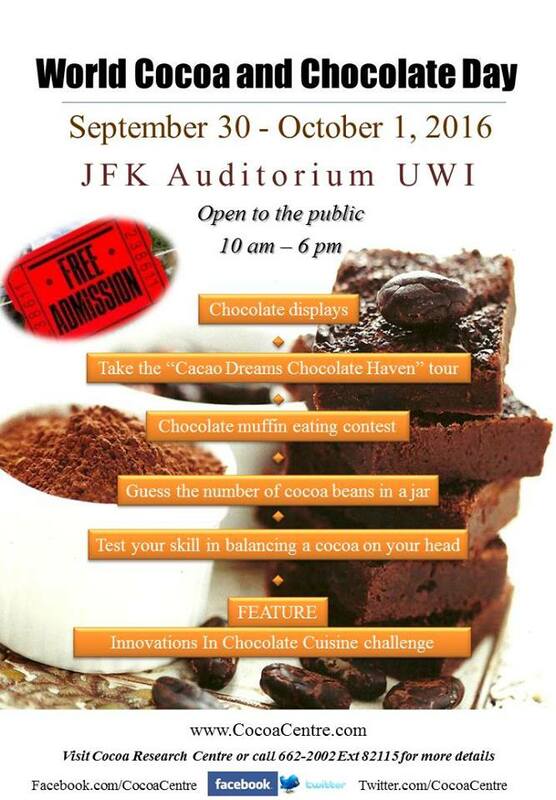 September 30th – October 1st WORLD COCOA & CHOCOLATE DAY at UWI (St. Augustine, Trinidad). UWI’s Cocoa Research Centre hosts its annual celebration for World Cocoa & Chocolate Day “featuring the best of the chocolate-based cuisines and confectioneries; and a competition fostering innovations in incorporating cocoa/chocolate into food. Link to more details (2016 Facebook event page) and link to flyer. 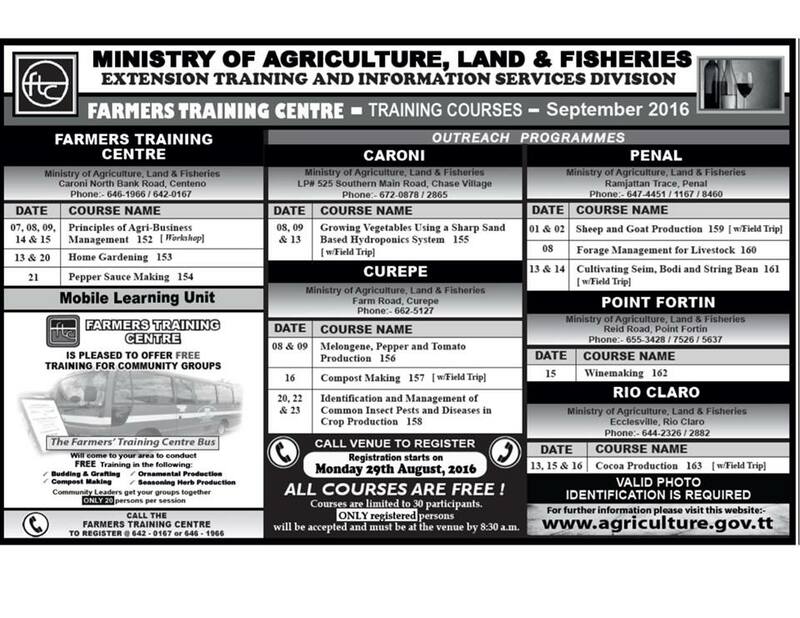 Ministry of Food Production Farmers Training Centre’s TRAINING COURSES: Classes include Avocado Production; Breadfruit Production; and Marketing Fresh Fruits & Vegetables in Local and Foreign Markets. 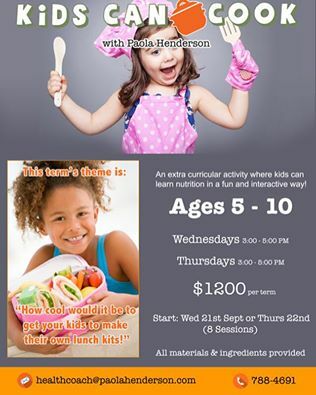 This month’s classes are offered in Centeno, Penal, Point Fortin, Princes Town and Rio Claro. Link to SEPTEMBER 2016 schedule and booking information. FREE! HIMCHULI RESTAURANT (San Juan, Trinidad) – Relocated to #101 El Socorro Road (next to Autorama). Hours: Monday to Saturday, 10am-9pm. (868) 782-8489. LA CANTINA PIZZERIA (Port of Spain, Trinidad) – Now open on Mondays. STARBUCKS (San Fernando, Trinidad) – Opened its first location in SouthPark Shopping Centre. Link to more details. Sunday, October 16th, 2016 TOBAGO BLUE FOOD FESTIVAL (Bloody Bay, Tobago). (868) 639-2125 or 639-4636 for more details. FREE ENTRY! Saturday, October 22nd, BLU-VINO, a celebration of fine wines and cuisines to be held at The Anchorage. Link to event page. 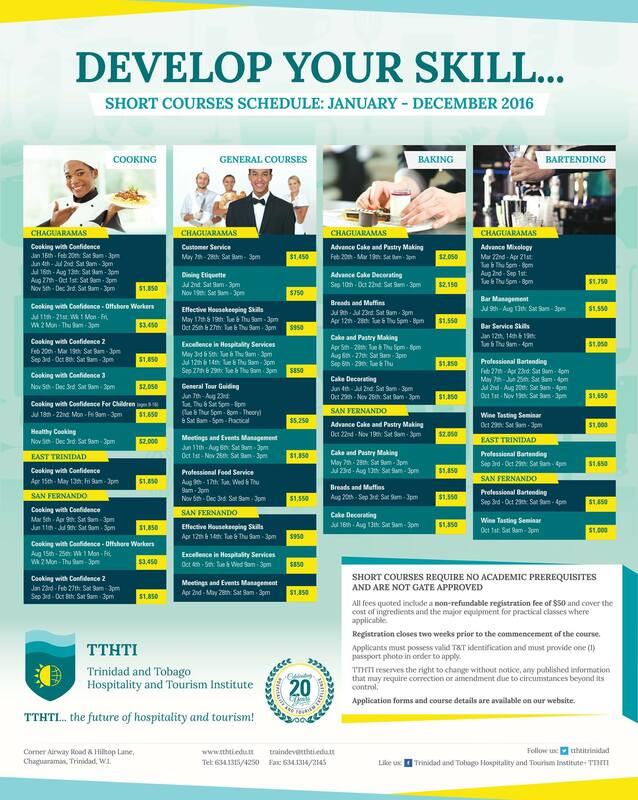 WINE TASTING SEMINARS and PROFESSIONAL BARTENDING short courses at TTHTI (Trinidad & Tobago Hospitality and Tourism Institute). Link to flyer.